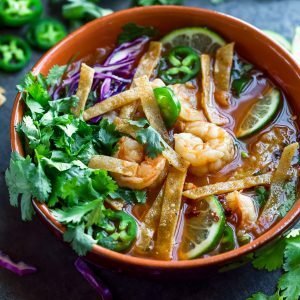 Spicy Shrimp Tortilla Soup ready in under 30 minutes and so crazy tasty! We are so totally in love with this delicious dairy-free soup. 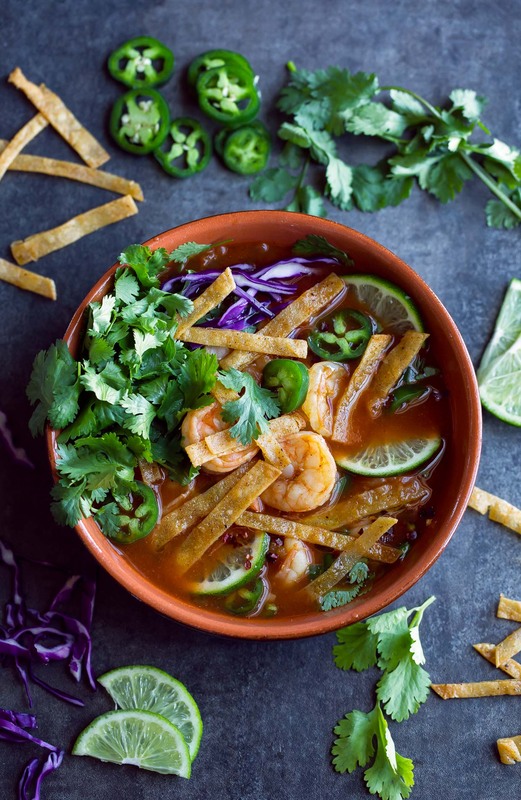 If you’ve been reading this blog for a while then it’s no secret we are seriously crushing on all things tortilla soup. I kicked things off with an easy peasy crock-pot chicken tortilla soup, followed it up with a crazy awesome vegetarian version, and now this spicy shrimp tortilla soup is here to complete the triology. I’m losing my mind over how good this soup is! I know, I know… shrimp tortilla soup sounds a little strange at first but think about how glorious shrimp tacos are. Now simply imagine them in bowl form; equally awesome and totally tasty! You guys are used to me losing it over recipes but when something this unexpected and delicious comes along I seriously drop everything I’m doing to get the post on the blog as fast as possible. I love the recipe, I love the photos, and I love that my husband sheepishly asked for seconds after devouring his serving in record time. This little kitchen experiment of mine was love at first bite and I can’t wait to add it to the weekly rotation of eats. Did I mention that the ENTIRE soup is made in one pot (whoooo! no mess!) and is done in under 30 minutes? Yields approx. 4 cups or 2 large bowls. Prep your shrimp and set aside. You can buy them pre-prepped or thaw and peel them yourself. I like to use smaller shrimp for this recipe (more shrimpy goodness in every bite!) but any size will work! Finely dice your onion and jalapeño, removing the stem and seeds from the jalapeño. If an extra spicy soup is desired, feel free to add some of the seeds back in, to taste plus top your soup with an additional sliced jalapeño too! You can make this soup as mild or as spicy as you'd like. Heat a large pot with 1-2 tsp of oil and sauté your onion and pepper until tender, adding the minced garlic towards the end and sautéing until fragrant. Add your broth, tomato sauce, salsa, and spices to the pot and stir. Bring to a rolling boil, add your shrimp, then reduce heat to simmer. Cook for 3-4 minutes for larger shrimp and 1-2 minutes for smaller shrimp, or until shrimp are curled and opaque. Times will vary based on shrimp size. Adjust accordingly. Add juice of half a lime and slice the remainder for serving. You can use this garnish to add as much citrus flavor as you'd like! Stir in cilantro, to taste and top with crunchy tortilla chips or strips. I like crushing up tortilla chips and sprinkling it into the soup like faux noodles. SO GOOD! Go crazy on the toppings or keep things minimal - anything goes! Paleo + Whole30: simply skip the tortilla crisps and you're good to go! No avocado oil? No problem! Use olive oil, coconut oil, or your favorite healthy oil. No salsa verde? I've made this with chunky red salsa too and it's fantastic both ways! No tomato sauce? You can use a 15 oz can of enchilada sauce (or yummy homemade enchilada sauce) instead. It tastes great both ways! Want extra shrimp in your soup? Feel free to add more! You can even add a chopped bell pepper and/or corn to the mix. Veg it up! Transform this tasty soup into a paleo + whole30 compliant dish by simply skipping the tortilla crisps on top. They’re fabulously optional and while it won’t exactly be tortilla soup anymore, it will be oh so tasty all the same! As written, this soup is quite brothy (totally what I’m craving right now!) so feel free to load it up with any extras your heart desires. Extra jalapeños, chopped bell pepper, corn (skip if paleo), and even extra shrimp are totally welcome here! 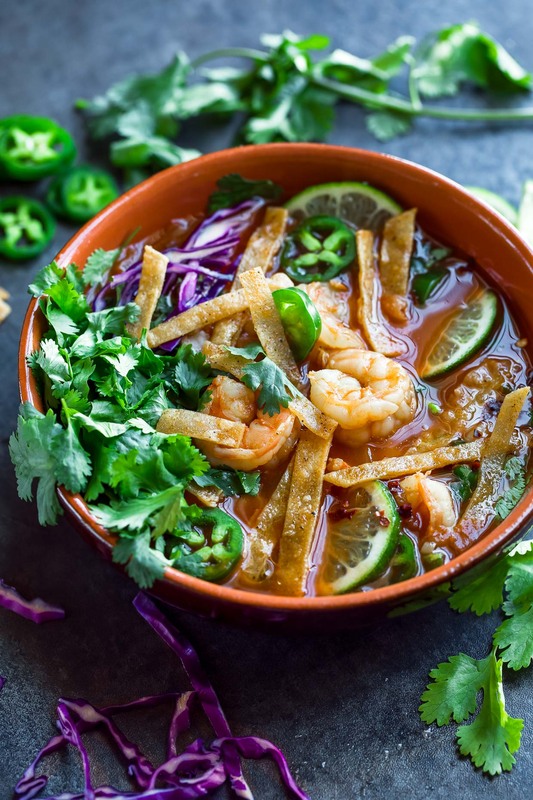 If you get a chance to try this spicy shrimp tortilla soup, let me know! This was perfect! one of my new favorite soups! Ahhhh yay! 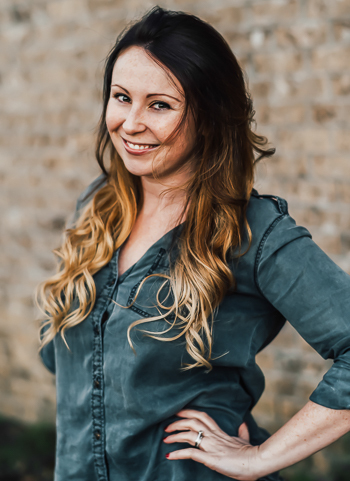 So happy to hear it Kelly – thanks! Everything about this sounds so amazing! I can’t wait to try it! I love the flavor of tortilla soup but don’t love chicken so this is perfect for me! I’d never thought to add salsa verde to soup but it’s so perfect! Shrimp makes a perfect alternative then! So glad you’re loving the recipe Amanda! Does anyone know if there is a non spicy version of this? Hi Ernesto! Simply skip the cayenne pepper and use 1-2 chopped bell peppers in place of the jalapeño for a non-spicy version. Red bell peppers make a great mix-in as does corn. Thank you Albert! I’ve made it so many times this week it’s bordering on obsession territory – SO GOOD!